How Did You Get Into Derby: I’ve been follow derby since my Daughter “Human Missile Crisis” first started playing. She challenged me to learn to skate and having been the guy who dressed out at 52 in full pads to walk on the field with the 20 year olds to play football, it’s been pretty hard to counter her incessant belief that I would eventually play derby. Highlight of Your Career: Yet To Be Determined,…… but it could well be hearing Willie announce my name and making a lap around the track for the first time. Most Embarrassing Derby Moment: Yet to be determined,…..I’m just hoping it doesn’t happen right after hearing Willie announce my name and while I’m making a lap around the track for the first time. 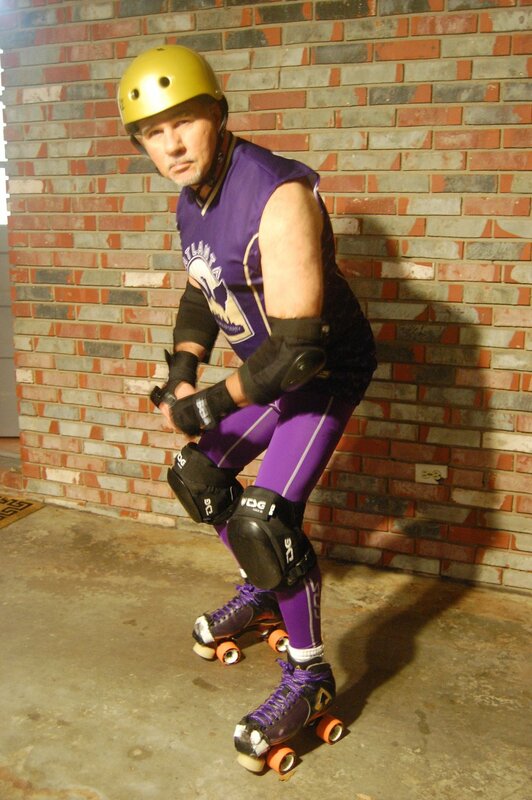 Derby Goals: I just want to contribute to the team and become a good derby skater.